If approved, it will be the Thousand Oaks-based biotech giant’s first new drug on the market since the FDA’s landmark approval of the first-ever biosimilar drug on the American market. 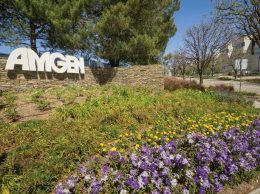 Amgen, facing pressure to develop its portfolio before biosimilar competition bites into its profits, is reassuring stockholders with positive results from the Phase III trial of its cholesterol drug evolocumab. Trials so far have indicated that the drug is capable of lowering LDL, or bad cholesterol. Preliminary long-term data also indicates it can halve the risk of major cardiovascular problems after a year of treatment. After the announcement of those results, Amgen’s stock rose 5.7 percent to $163.03, its biggest gain since October. The U.S. Food and Drug Administration has until Aug. 27 to decide on evolocumab, which Amgen plans to market as Repatha. If approved, it will be the Thousand Oaks-based biotech giant’s first new drug on the market since the FDA’s landmark approval of the first-ever biosimilar drug on the American market, Zarxio, which is based on an Amgen drug. Zarxio was developed by Sandoz and mimics Amgen’s chemotherapy drug Neupogen. And Amgen isn’t the only firm vying for approval of its cholesterol treatment — Sanofi-Regeneron released results for alirocumab, a PCSK9 inhibitor like Amgen’s evolocumab that also was shown to cut LDL by 60 percent. The FDA will make its decision on that drug by July 24. The drugs work by blocking the protein PCSK9, which helps the body clear LDL from the blood. Both treatments are primarily directed at patients with familial hypercholesterolemia — or genetically high cholesterol — and can serve as an alternative for patients unable to tolerate statins, such as Pfizer’s popular Lipitor. They will be specialty medications in high demand and likely priced accordingly, but the drugs’ similarity will allow insurance firms to push competitive pricing. “With dose convenience of little concern to payers, price is the key issue to secure favorable insurer coverage,” according to Michael Shah and Sam Fazeli, analysts at Bloomberg Intelligence. Heart disease remains the world’s No. 1 killer, and with 620,000 Americans suffering from familial hypercholesterolemia, executives at CVS Health last month estimated that the new class of drugs could represent a $16.4 billion market. And if the 3.2 million statin-intolerant patients are factored in, that number is more likely to fall between $50 billion and $100 billion, CVS Health said. Two other drugmakers are currently developing PCSK9 inhibitors in an attempt to claim a share of that market: bococizumab remains in development at Pfizer, and a drug known as LY3015014 is in Eli Lilly’s pipeline. If the Sanofi-Regeneron and Amgen treatments are approved, the firms will likely seek to expand the drugs’ indications to include heart-attack prevention. The evolocumab study, funded by Amgen, found just under 1 percent of patients on the medication for a year experienced a heart complication, compared with 2.18 percent on standard treatment. The results of both drug trials “whet our appetites for further results that show cardiovascular benefit and documented safety, even at substantially lower LDL cholesterol ranges than achieved before,” cardiologists Neil Stone and Donald Lloyd-Jones wrote in a New England Journal of Medicine editorial accompanying the published studies. The study was a one-year extension that enrolled about 4,500 patients who had already participated in an evolocumab trial. The subjects were re-randomized to receive Amgen’s drug plus standard of care or standard of care alone. Amgen is also conducting a multi-year, 27,500-person trial to gather data on the drug’s effects compared with standard care. Results are expected by the end of 2017.